I don't post these pictures as great examples of astrophotography - that much is clear but I'm always keen to point out what is around us to be observed with very little effort and minimal cost. I woke up around 3 in the morning a few days back and thought I'd take a look outside to see if the Leonids were in evidence. Sadly as I poked my head from the seventh story of the building to the West of Santiago there were no shooting stars in evidence but Orion was standing there clearer than I'd seen it for a long time - we've had terrible storms for the last week or so and this was the first chance to see the stars in a while. 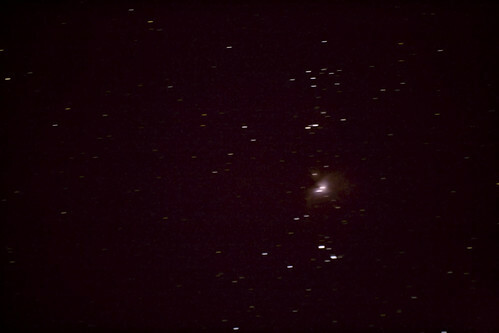 I set up the tripod, mounted the 300mm lens onto my Canon and took a few snaps to see how clearly one can see the orion nebula from a small city. I'm pretty pleased with the results for a first serious try and with a body which deals better with low light I think one could get some spectacular results. The point to make with such a shot is simply that although we think of the night sky as a simple distribution of points of light, really there is structure out there even at the grossest scales, from the giant gas clouds surrounding old supernova remnants to the galaxies observable with the naked eye on a truly dark night to the phases of Venus, the bands of Jupiter and the rings of Saturn - such things are not only there to be seen by those with research budgets and large inheritances. All you need is enthusiasm, some truly minimal equipment and a little time to explore.